Officer's Choice whisky from Kishore Chhabria-led Allied Blenders & Distillers and McDowell's from United Spirits stables, are among the largest-growing brands on the Real 100 list prepared by global spirits research firm IWSR. "This shows there is growing thirst for Westernstyle spirits in India. Last year's 7th-placed brand McDowell's posted growth of 4 million cases, moving the brand to sixth place." "Officer's Choice surpassed this, growing by nearly 5.5 million cases to overtake McDowell's and become the world's largest whisky brand," IWSR said in its latest report. Image: Mariann Lau serves glasses of wine in Las Vegas. Johnnie Walker, the largest Scotch whisky, was also helped by healthy growth in India and South Africa. It moved two places up the ranking to number eight, closely followed by Celebration rum, which also jumped up two places. Johnnie Walker is one of nine Diageo brands on the Real 100 list, equalling USL's nine brands which include Celebration rum and McDowell's. 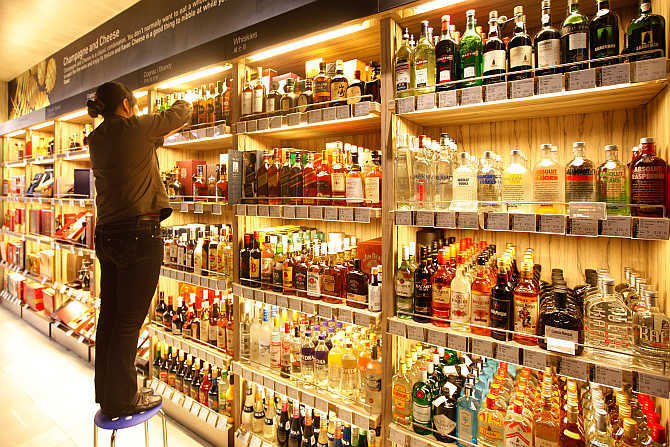 Image: An employee arranges bottles of whisky at a supermarket in Shanghai, China. Diageo's acquisition of a controlling shareholding in USL in 2013 means the combined entity has 18 brands in the list. Beam Suntory has five brands on the list after Suntory's recent $16 billion acquisition of Beam Inc.
Pernod Ricard has 11 brands in the list with Indian whisky Royal Stag ranking highest. Image: A waiter is reflected in a mirror as he pours whisky in Beijing, China. 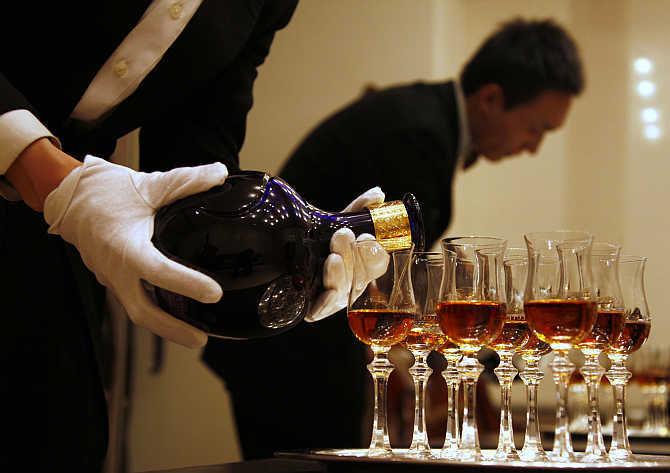 IWSR further noted that Emperador brandy became the second-largest spirits brand in the world in 2013. Global volumes of Emperador grew by nearly 2 million nine-litre cases, while volumes of Thai spirit, Ruang Kao slipped back. However, the Emperador brand, whose owner recently acquired Whyte & Mackay, is still less than half the size of the world's largest spirit brand Jinro, despite the number one soju brand losing volumes in 2013. 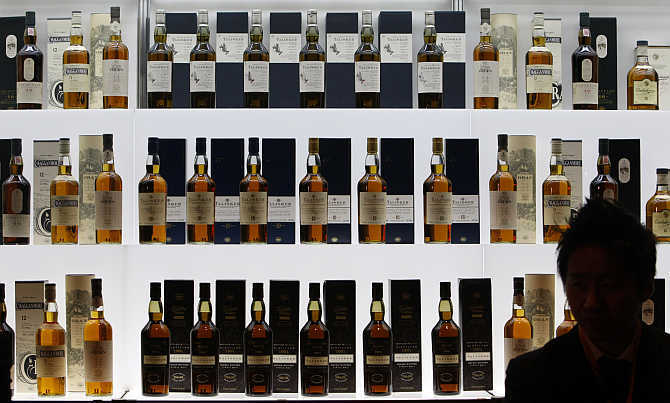 Image: Bottles of malt whiskey are displayed at a whiskey merchandising event in Tokyo, Japan. Eight of the top 10 brands are local supergiants, predominantly selling in their local markets, all of which are in the Asia-Pacific region. Thai Beverage now has two brands in the top 10 as Hong Tong 'liquor' moved up with 13 per cent growth. Bacardi fell from the top 10 as sales declined. 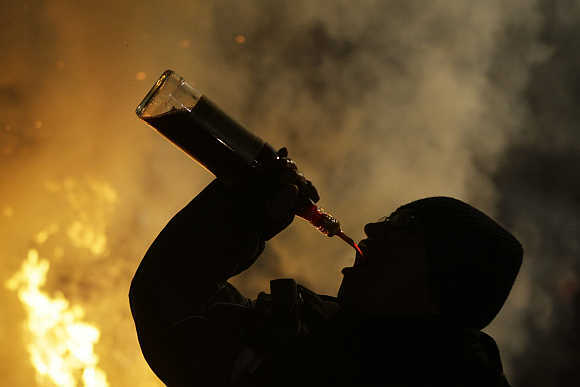 Image: A man downs alcohol during the annual Saint Anthony purification ceremony in the village of San Bartolome de los Pinares near Avila in Spain. "It is the highest ranking of the four brands in the list for Bacardi-Martini." "With Bacardi's departure from the top 10, only Smirnoff and Johnnie Walker are recognisable international brands, showing the continued dominance of local super brands. Sixty-three of the 100 brands on the list derive 90 per cent or more of their sales from their domestic market," IWSR said. 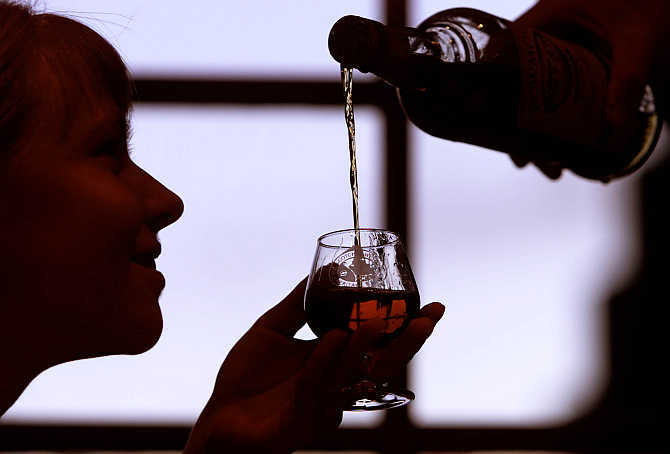 Image: A woman extends her glass for whisky in Edinburgh, Scotland.